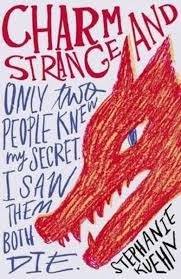 This month, my debut young adult novel, Charm and Strange, is being released in paperback in the UK. As the back copy of the book reads, it is “A deftly woven, elegant, unnerving psychological thriller about a boy at war with himself….a masterful exploration of one of the greatest taboos.” In short, it’s about a boy who believes himself to be a monster. It’s also about understanding why. I began writing Charm and Strange in the spring of 2011. As the story moved along on its two-year path to publication, there were many kind people who read the manuscript and corresponded with me about it: friends, fellow authors, literary agents, editors, etc. Yet when I reflect back on that time, there’s one thing stands out to me about all of these interactions. With the exception of a single person, no one ever directly addressed the events of the book—what it’s really about. This is an observation, not a judgment, and it holds true for me, too. When I engage with someone about the story, we often talk around what happens to the narrator and his family. We cloak the core events in the book with soft language and euphemisms. Gestures, even, if we’re speaking face to face. To be fair, the characters in the book don’t use direct language to describe their experiences, either. That’s one of the book’s main themes: how the unspeakable is transformed and expressed in nonverbal ways. However, the fact that some people’s realities truly are unspeakable is the reason I wrote the book in the first place. It’s also the reason why I think books that tackle difficult and discomforting topics, are necessary. Imperative, really. Reading someone else’s words or someone else’s story is a unique form of human communication—a uniquely safe one. This is the magic of books. They’re stories we can connect with emotionally, but they are also a form of communication that can be controlled by the reader. For kids or teens or anyone who doesn’t have the luxury of safety in their lives, a book holds confidence. A book is a confidante. Young people know this, intuitively and explicitly. It’s why books such as Hold Still (Nina LaCour), Wintergirls (Laurie Halse Anderson), Crank (Ellen Hopkins), Hate List (Jennifer Brown), Living Dead Girl (Elizabeth Scott), Smack (Melvin Burgess), Stolen (Lucy Christopher), A Monster Calls (Patrick Ness) and many, many more, have resonated with teen readers. That resonance isn’t always about personal identification, either. Reading is a safe, non-judgmental place to explore emotions and thoughts that are scary or shameful or not well-understood, and we live in a world that doesn’t have a lot of safe, non-judgmental places. Adults know this, too, I think. We really do. Just like we know it’s hard to speak up when we don’t feel safe, it’s also hard to talk about the things that scare us the most. This knowledge is why I hope that challenging and difficult teen books can be recognized for the difference these stories can make in the hearts and lives of young people who are vulnerable or voiceless. Despite our collective discomfort, there’s true grace in a medium that has the power to help someone who’s endured the unspeakable feel like less of an outsider. Or, as the case may be, like less of a monster.